Karachi Medical & Dental College (KMDC) announced its admission dates. Last date to submit application form is 15th October, 2016, and test will be held on 6th November 2016. KMDC test will consist of MCQ’s type questions from Biology, physics, Chemistry and English. 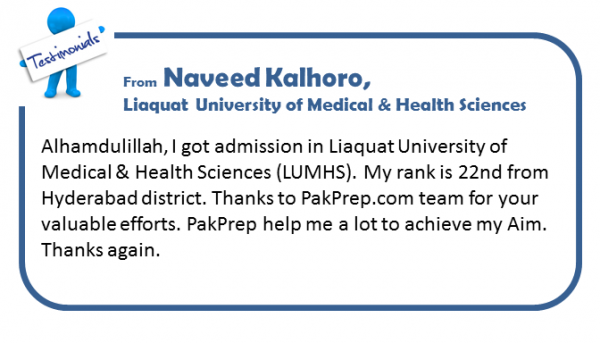 Pakprep.com provides complete online preparation for Karachi Medical and Dental College. For your preparation Click Here. This entry was posted in Karachi Medical and Dental College (KMDC), NTS, Sindh Medical MCAT, Sindh NTS and tagged Best way to prepare for NTS, How many MCQs in Sindh MCAT, How to Download NTS form, How to Prepare for Sindh MCAT, Karachi Medical, Karachi Medical & dental College, Karachi Medical admission test, Karachi Medical College, Karachi Medical College Admission, Karachi Medical College admission 2016, Karachi Medical test 2016, KMDC, KMDC Admission, KMDC Past paper, KMDC past papers, KMDC sample paper, KMDC solved MCqs, KMDC test, KMDC test 2016, KMDC test dates, KMDC test pattern, mbbs, MBBS 2016, MBBS admission, MBBS in Pakistan, mbbs merit list, NTS, NTS Biology, NTS Biology MCQ's, NTS Chemistry, NTS Chemistry MCQ's, NTS English, NTS English MCQ's, nts fee, NTS IM, NTS MCQs solved, NTS Medical, NTs Medical Test, NTS old papers, NTS Pakistan, NTS Past Papers, NTS Physics, NTS Physics MCQ's, NTS Preparation Online, NTS SOLVED MCQS, NTS Solved paper, nts solved papers, NTS test, online preparation for NTS test, sindh mbbs, Sindh MBBS Admission, Sindh MBBS Admission 2016, SINDH MBBS TEST, Sindh MBBS test 2016, Sindh MCAT Biology MCQs, Sindh MCAT Chemistry MCQs, Sindh MCAT Entrance Test, Sindh MCAT MCQs, Sindh MCAT Online Preparation, Sindh MCAT Pattern Format, Sindh Medical, Sindh Medical Colleges, Sindh Medical Entry Test, Sindh Medical MCAT, sindh medical test on October 5, 2016 by Pakprep.com Admin.